The Adaptec VideOh! 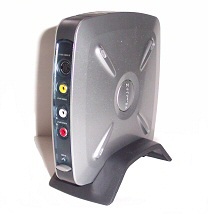 DVD AVC-2210 is a hardware mpeg video capture device. It is similar to the Pinnacle USB MovieBox, but does not offer any video out connections. 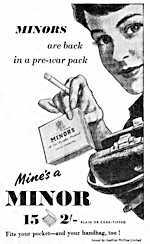 You also have an on/off switch. When you connect the device, the LED on the side is yellow. When you install the driver, the LED goes green. There was no need to reboot after the PC detected the USB device and prompted for the driver, but the unit will not work with any other video capturing software, so you need to install Sonic MyDVD to actually use it. The software installs foreign language help files and a quick launch link without asking, which takes more hard disc space, and then installs ShowBiz with sample projects (with no option to not install them). You must then reboot. Along with the power supply you get a standard Type A to Type B USB cable and a triple phono to phono lead for video and stereo audio. As this is a hardware capture device, it does not work with any other video software, like AMCap, Sony's Video Vegas or any of the Ulead suite of programs. The only software that the device will capture with is Sonic MyDVD. Running the software, you choose either a DVD project or Video CD project, and this determines the format to capture. It should be noted that you must change both the temp directory and capture directory. I changed the capture directory to drive G (which had 14 gig free, enough for 4 hours of DVD capture), but the program still only showed a small amount available, as the temp dir was still set to the default drive C (which had one gig free after the installation). Changing the temp directory requires a restart of the program, but then the free amount of space was shown correctly. As the program captures to the temp directory, and points to the capture directory when you save a file, the latter seems to be no more than a pointer for the save function. 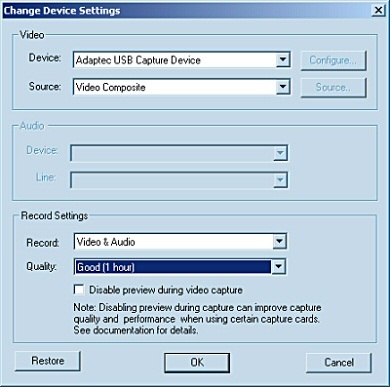 As with other USB capture devices, there is a delay of about two seconds between the source and the preview on the PC. 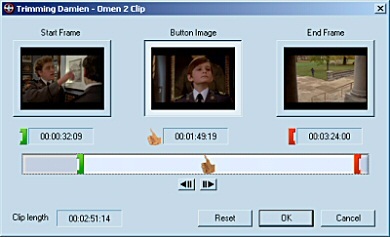 When capturing there is a start delay of a second or so after you press the Start Capturing button, but unlike Pinnacle's MovieBox, the video/audio is not captured in this time, so you must press the button a second before you want to it start. After a capture, you are given the option to save the captured mpg file to directory, and then it is added to media. There is tick option to add it straight to the menu system of your disc. The window appears on top of the main program of Sonic MyDVD and it looks a little messy. I captured video footage fine using the DVD project, but had severe problems capturing to Video CD. I changed the project type, but the program seemed to hang when you clicked the Capture button. Quitting the program and selecting Video CD from the start faired better. I tried to change the record settings (as the capture screen indicated that you could) but the screen didn't allow me to change anything. I don't know what the Good (1 hour) setting meant, as according to the main screen I had over 10 hours of hard disc space available. The software was obviously designed to work with hardware where this setting could be changed, but with the Adaptec unit this setting is fixed. There are controls underneath the preview window, which you can use to control a digital DV camera, but I didn't have one to try with the device, so they were greyed out. The format that the program captured the video footage was not the standard for Video CD. The last revision on this standard was in 1995, and Video CD 2.0 was defined as Video: 1150 kbit/sec MPEG-1, 352 x 288 pixels frame size (PAL), 25 frames/second (PAL), Audio: 44100 Hz 224 kbit/sec MPEG-1 Layer2. The file that I captured had a file format label of PAL DVD, with a video data rate of 1100 kbps, and an audio type of LPCM Audio, with attributes of 48000 Hz stereo, with no layer or bit rate info. This meant that some video editing software I tried would not recognise the file as a valid mpeg file, unable to see the audio channel, and others would have to recode the file (reducing the picture quality) before burning it to a disc. Video clips can be edited, but they are sent to another program called Arcsoft ShowBiz. You can send just the selected clip on the menu, or all of the clips. Trimming the beginning or end of a clip using the non-windows like interface is strange. You can play the clip to find the start and end points, but the playback is not a full 25 frames per second, although you do hear the audio fine. Once you find the start point, you drag the green scissor point to the playback point. You can advance or reverse a frame at a time using the plus and minus keys to find the end point and drag the red scissor point to the playback mark. You cannot enter the time to go to a particular point. This file then needs to be saved as a separate mpeg file, or exported to a MyDVD project. If you don't want to do this, you can double click on a clip and you will get a simpler interface to set the start and end point, as well as the thumbnail to use in the menu. You only get a small view of the clip, and you cannot play the clip to get any audio reference. You need to run the menu to see the clip. The default menu is a motion menu (with clouds moving in the background and the clips playing on the screen in thumbnails). This takes a while to render, and you can view the menu as a still screen, but the final disc will have to render the menu, and this will take extra space on the disc. 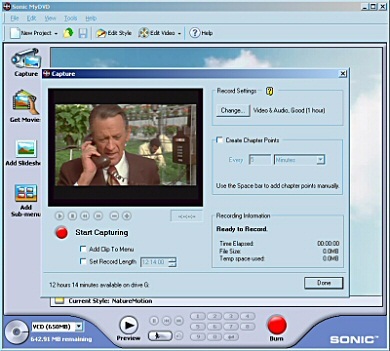 Even with ShowBiz, Sonic MyDVD is more directed to creating a Video CD or DVD direct, capturing clips and added them to the menu. 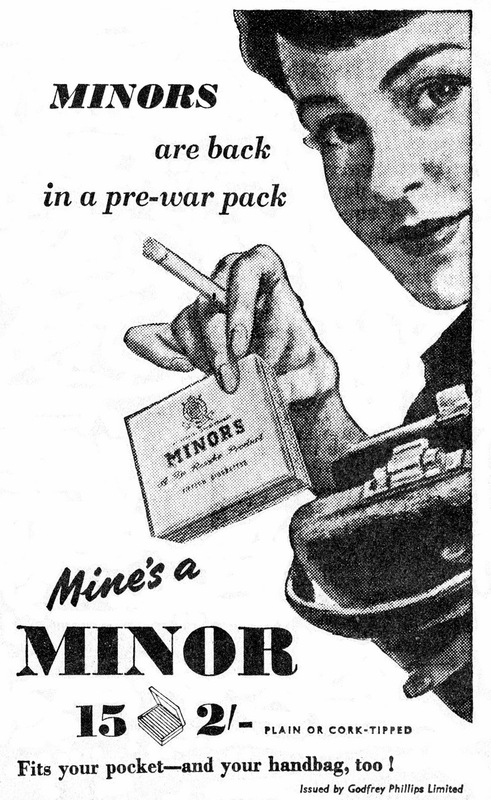 The choices of menu designs are limited, with the similar six thumbnail layout. I've used quite a few different video editors and I did not find ShowBiz intuitive at all. Like the Pinnacle USB MovieBox, I would have to capture using one program, and then edit the files using a different one that I was comfortable with, like Ulead Studio 7, Sony Vegas Video or Adobe Premiere (if I was running XP, as the latest version doesn't work on any other operating system). It's a shame that the hardware (or maybe the software driver) does not produce standard mpeg files (at least in the video cd format). Limiting the hardware to work with only the supplied software is another annoyance. 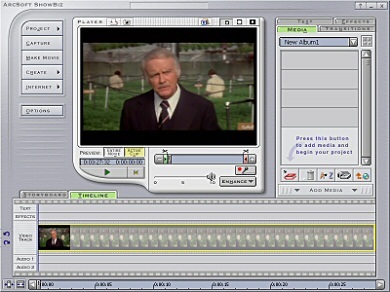 The lack of video out on the unit means that any video files produced will have to be written to a video cd (and probably recoded, reducing the quality) or DVD (meaning you need a DVD writer).